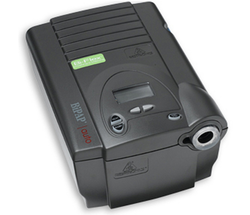 Leading Manufacturer of bipap auto series and bipap m-series from New Delhi. M Series BiPAP Auto brings together a unique combination of Respironics technologies to create the most feature packed and cost effective BiPAP on the market. The M Series Bipap differs from a CPAP in that it switches back and forth between two pressure levels, one higher and one lower, rather than providing one continuous pressure level. The pressure upon inhalation is higher to hold the airway open, but as the user exhales, the pressure drops to a preset lower level. A bilevel machine responds well to people with very high CPAP pressure needs, weak chest wall muscles, lung disease or other health problems that keep them from being able to exhale against a CPAP pressure. 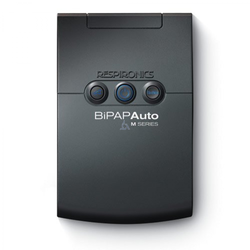 The BiPAP Auto features a proactive, multi-level algorithm that analyzes several parameters to monitor and respond to a patient's breathing. A key parameter is flow limitation (a common early indication of complete obstruction). The auto algorithm performs two types of tests (Pcritical and Poptimal ) that allow the pressure to be maintained at a level at which obstruction is not likely to occur but is not unnecessarily high, thus maximizing patient comfort. Uses two different sets of analytical parameters to keep track patient's breathing. Tracks and reacts to a patient's natural breathing pattern. It can detect the point of inhalation and exhalation in every breath, allowing Bi-Flex to make each breath more comfortable. Tracks factors like apnea / hypopnea index, leak and snore.